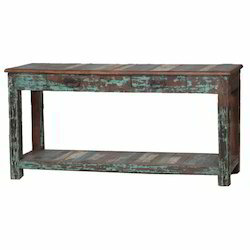 Distressed teal Reclaimed Wood Console with colored panel on the tabletop and bottom shelf. The interesting color synergy of this piece would render it quiet the conversation starter as a funky workbench or serving station. Classical wooden console hand crafted which makes your home entrance brilliant and can be placed in front of empty wall. The marble top enhances the look on this Golden antique polish. Contact for more designs and queries. The beautifully designed Wooden Carved Console Cabinets are manufactured and distributed by us. To manufacture these products we use the best quality of raw materials which are procured by our reliable vendors. Our experts have carved these products nicely and they are used to increase the beauty of decor. With fine finishing they satisfy our clients at maximum level. Being a leading firm in this industry, we are deeply engaged in offering a high quality range of Wooden Console Table. Huge Console with extremely intricate wood carving. It has an arrangement for a marble/glass top. Our organization is widely appreciated for offering the best and elegantly designed Wooden Console Tables. We use teak, deodar wood for manufacturing Wooden Console Tables. Designed to perfection, the Wooden Console Tables can be used for both commercial and residential purposes. 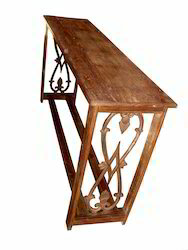 Further, these ..
We are among the reputed organizations, deeply engaged in offering an optimum quality range of Iron Wooden Console Table. We are successfully engaged in providing a wide gamut of Wood Console. Table is a piece of furniture with a smooth flat top, backed up by one or more vertical legs. Wood is an ideal stuff for making up tables, as it is resistant to decomposition and pulverized. Delicately cut up wooden tables is sure to leave the buyers fascinated. The complex design on the wooden tables shows the crafter's zest for excellency.